The celebrations of the Main Saint of the Town, Saint Librada, is mended to the year 1692, that was when is presumed that the first church to the virgin was built, that some people know with the name of" The Pilgrim", " La Pequeñita” [The Tiny one], "The Moñona” [from long bun] and " La Chola” [The dark-skinned one], in allusion at four images that exists in Las Tablas. 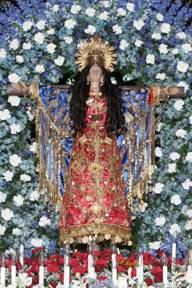 It is estimated that was in 1750, when The Moñona arrived to the church, and since then this is the image that during the local holidays, is adorned with almost all the golden chains that the devout give her in gratitude by a favor granted. People from Las Tablas celebrate with devotion their local holidays, participating of the novenas that is initiated on July 11 th until the 19 th which is the night of the procession where thousands of faithful walk with their worshipped saint. On July 20 th is the date in which the town of Las Tablas and from other regions participates of the religious ceremony in honor to Saint Librada. The church that has its name is too small to receive to people from Las Tablas and to the faithful of other regions that come to pay the favors that the “Moñona” has conceived them. But the celebrations do not finish here, but the religious festivals are combined with the cultural aspect. The fact is that the National Festival of the “pollera” is given in the framework of these local holidays of Saint Librada. A statue to pay respect to Saint Librida. Panama has one of the richest cultural histories in Central America. This culture can be felt in all aspects of typical Panamanian life. Every town embraces its heritage and treats all visitors with welcome arms. So when you visit the Azuero Peninsula and gaze upon the Ocean Front property or Ocean View Real estate remember your buying more than just land in Panama.